Described as a recent garden introduction in 1935, the lovely true-blue flowers of this forget-me-not, with their tiny scalloped petals, possess a sweet innocence. This selection is taller than most, with sprays of flowers all summer and fall. They dislike heavy clay soils. Self sows. A charming small flower that looks like baby snapdragons in a fruit salad mix of colors of yellow, rose, blue, violet and more, most often sweet bicolors. A cheerful early summer edger, the seeds should be mixed with sand to sow thinly in earliest spring, for they revel in cool weather. If you love poppies, and just hate to see them go by as summer takes hold, you will love these silky, lemony cups of bloom. Long-flowering, throughout summer and into fall, its fabulous ferny grey-green foliage completes the package. Provide excellent drainage. Self sows. A fresh and sweet pure pink flower with various shades of the original rich pink. 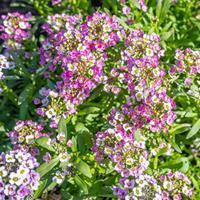 A scatter and grow easy annual that blooms in 6 weeks from seed, and can be sown twice or more a season. Best in early summer and fall as it dislikes high heat. Attracts beneficial insects to your garden.